Static discharge is a valid concern in today’s highly technical environments. Different levels of ESD protection can be achieved with Electra-Tec™ technical furnishings. Major components of workstations including the operator can be connected to a common point and the static dissipated to ground safely through a one meg ohm current limiting resistor. Work station components having facility electrical power can be isolated to prevent ground loops and transient electrical currents. Isolation pads are available for components having facility electrical power. 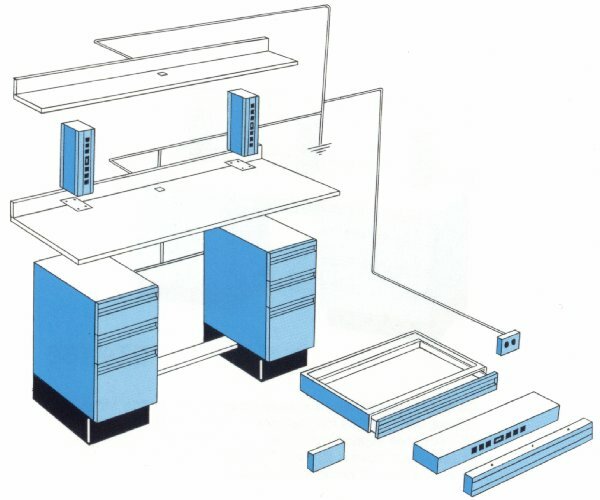 The expanded diagram above depicts components that make up a basic workstation. ALL MODELS AND COMPONENTS CAN BE DISSIPATED OR ISOLATED FOR ESD PROTECTION. 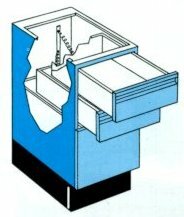 Can be internally wired so that all drawers are constantly grounded while being opened and closed. Can be isolated from a static dissipative bench top by using an insulating isolation pad. With or without power can be tied to ground at the common point block. CONDUCTIVE DRAWER MATS: Dissipate static charges and also cushion delicate instruments. WRIST STRAPS AND HEEL GROUNDS are also available.